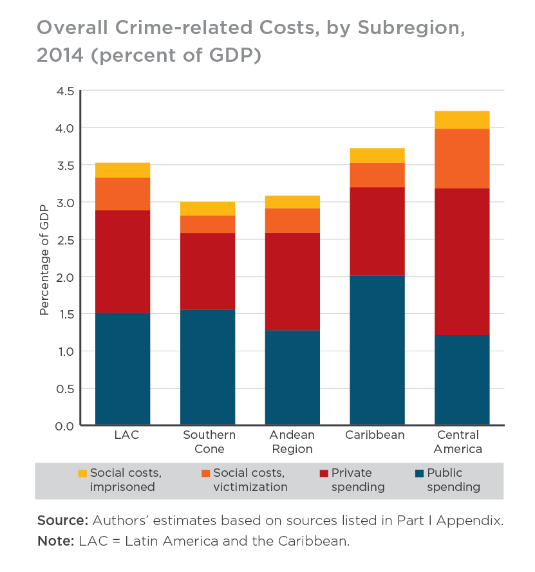 A study by the Inter-American Development Bank (IDB) estimates the direct annual cost of crime and violence in Latin America and the Caribbean at $261 billion or 3.55 percent of GDP – roughly what the region invests on infrastructure and double the average cost for developed countries. It is also the equivalent income for 30 percent of the poorest population, underscoring the grave development impact violence has on the region. 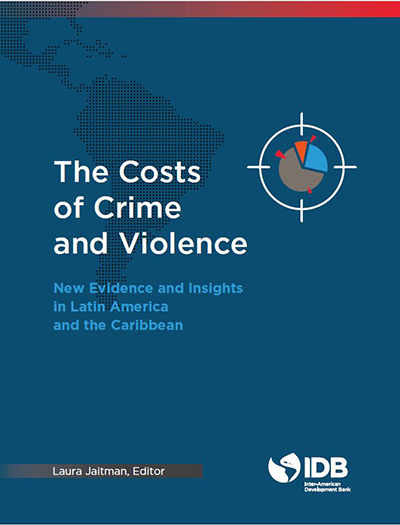 The Costs of Crime and Violence: New Evidence, New Revelations in Latin America and the Caribbean is a landmark effort to provide comparable crime costs numbers for 17 countries in the region, benchmarking them against 6 developed countries. 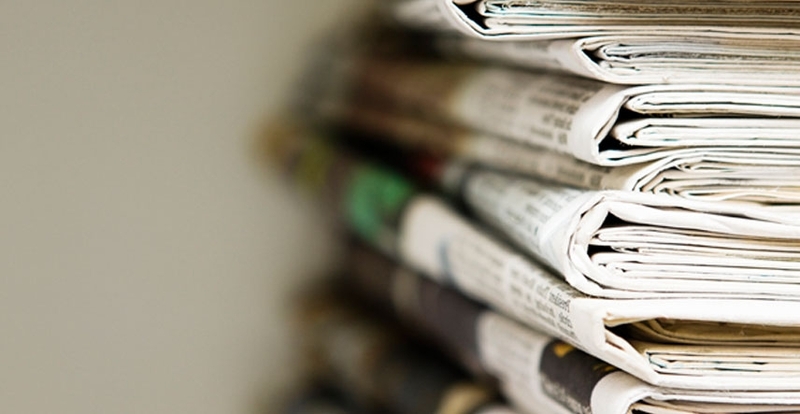 Crime and violence are at near crisis levels in Latin America and the Caribbean. The region accounts for 9 percent of the world’s population but contributes nearly one-third of its homicide victims, making it the most violent region outside of war zones. Six out of ten robberies in the region involve violence and 90 percent of murders go unresolved. Its prisons are the most overcrowded in the world. 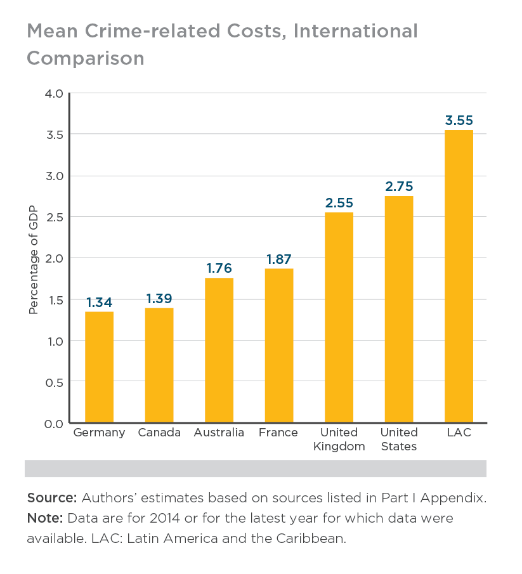 Crime-related costs are on average 3.55 percent of GDP in Latin America, compared with 2.75 percent in the US, 2.55 percent in the UK and 1.34 percent in Germany. If the region brings its crime costs down to the level of developed nations, it could increase its infrastructure investment by 50 percent. 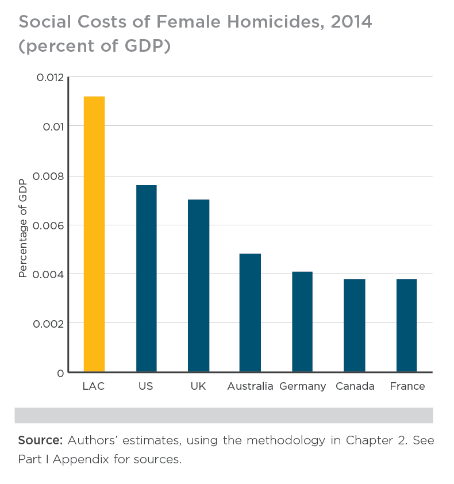 The study has chapters that analyze crime costs in Brazil, the Northern Triangle and the Caribbean and breaks new ground in calculating the direct costs of homicides as well as the foregone income of the victims of homicides (0.36 percent of GDP, or an annual average of $10.5 billion for the 2014-2015 period). 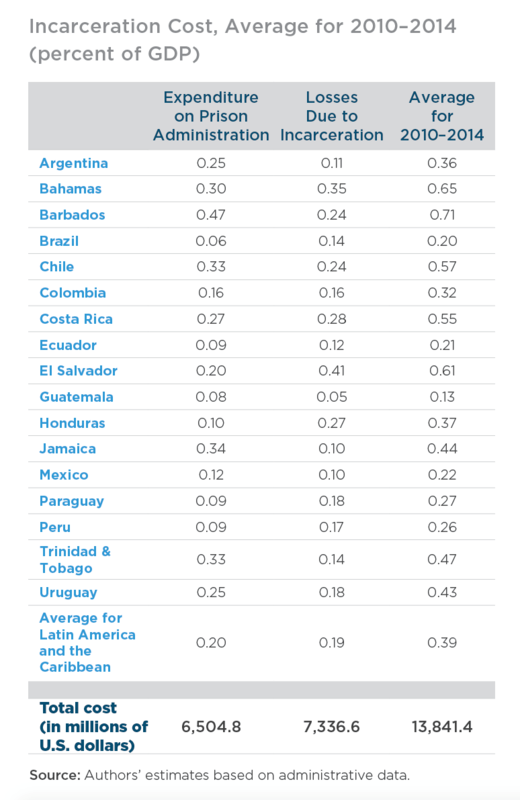 It also points out the steep costs of Latin America’s high incarceration rates. For the 2010-2014 period, the region spent $6.5 billion per year to maintain and build prisons. On top of this, imprisoned individuals forgo an additional $7.3 billion annually in income. 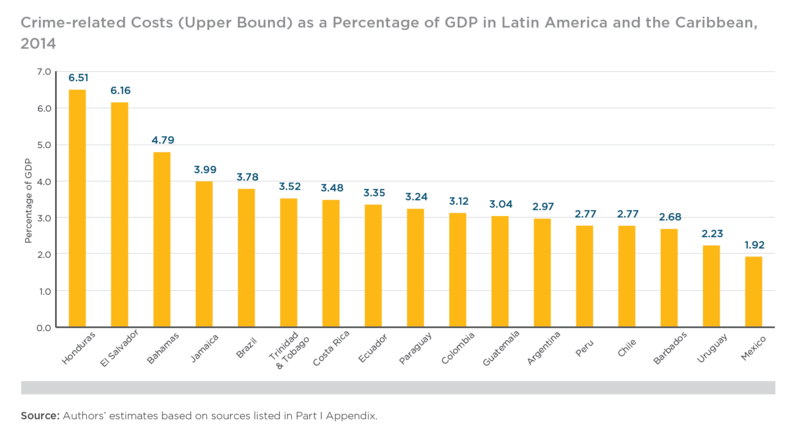 The two numbers together amount to 0.39 percent of GDP, more than the conditional cash transfers for the region’s poor. Costs of violence against women in Latin America and the Caribbean double the world average, and the study points to future avenues for more research on gender violence. The book includes chapters on cybercrime and organized crime.